Last month my blogging friend, Ainsley at Chattahoochee Mama, had the great idea for an online book club. We all read the same book and then post our thoughts. 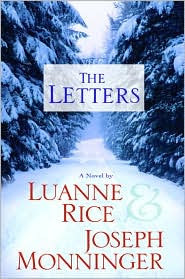 The book for this month was “The Letters” by Luanne Rice and Joseph Monninger. It was great pick for December. The book is less than 200 pages so it wasn’t overwhelming with all the holiday rush. The setting for the book is December and letters are written between a husband and wife, one in Alaska and the other in a little lobster town in Maine. Not only are Sam and Hadley seperated by the miles, but the pain of losing their 20 year old son, their only child, has also has driven a wedge between them. The letters are initiated by Sam as he strives to explain to his wife why he feels he must visit the place of their son’s death – a plane crash site in the Alaskan bush. The letters they write to each other give them the freedom to say to each other what they have been too afraid and too hurt to share as their marriage has slipped to the point of their upcoming divorce. In the letters they share their every day events – Sam’s adventure to the crash site on dogsled and Hadley’s renewal of her love to paint in the artistic coastal town – intermingled with deeply heartfelt pain and love. The book had just enough twists and turns to keep it interesting and the right amount of feeling and emotion to make it authentic. It wasn’t at all overly romantic or sappy but real love between two people that had experienced one the hardest things life can bring – the death of a child. I enjoyed reading it and look foward to seeing everyone else’s thoughts. Great review, Jenni – I’m glad you enjoyed reading it. I really had no idea if it would be good or not.=) But I thought it ended up being a good pick for December, too! Thanks for being a part of the Hoochee Book Club!